Extra Tables for the Gang! Description: This folding long banquet table is perfect for any special event. For indoors or outdoors, churches, weddings, schools, banquet facilities, backyard barbeques, graduation parties and more. 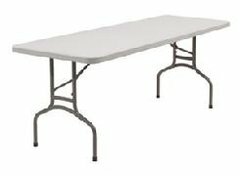 For any professional event these banquet folding tables are weather-resilient, lightweight, and with their folding legs convenient to store. The plastic table top makes cleaning a breeze.